very nice but the color is much more like a denim than a navy. also the side board is in 2 piece so it makes it look a little cheap. but altogether it looks great. Dimensions 82.7 In. X 33.8 In. X 6.3 In. “This is really well made.” my husband noted as he put it together. Our memory foam mattress lays on it fine with no box spring. The stripes on the headboard are subtle as I had hoped so they’re not a focal point in the room. There are four cute blue cloth covered (same cloth on the bottom frame, excluding wooden legs) buttons that add character to the headboard too. Also the price always helps a bargain hunter love an item! I love this bed. It looks amazing. The only thing you need extra is box spring which is little annoying to me because i was expecting platform bed so i can eliminate box spring. However, It is not a big deal for a price of a bed. I would recommend this product to family and friends. I am 60, my male friend is 65. We both have back issues, but were able to assemble the full-size bed in under two hours. It is sturdy. Box was slightly damaged on arrival. Look at my photo. My foam mattress is 12 inches. It leaves that gap for things to fall through or feel a draft. 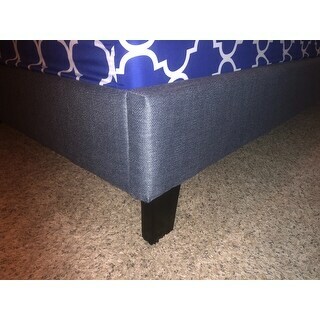 The mattress is nested in the frame, meaning that I had to LIFT the heavy foam mattress to get the bottom sheet on. I see this as a deal breaker, because it was so hard for me physically to lift each corner of the mattress to get the sheet on. I would need to add a small box spring to resolve both of these height issues. Luckily, this is in a guest room so will see little use. Color is a neutral. beautiful fabric, very sturdy frame. The five slats with support feet on the frame gives the bed frame great support and transformed our too soft mattress into one that is much more comfortable and supportive. It took us about 1.5 hours to assemble but very satisfied with end product. 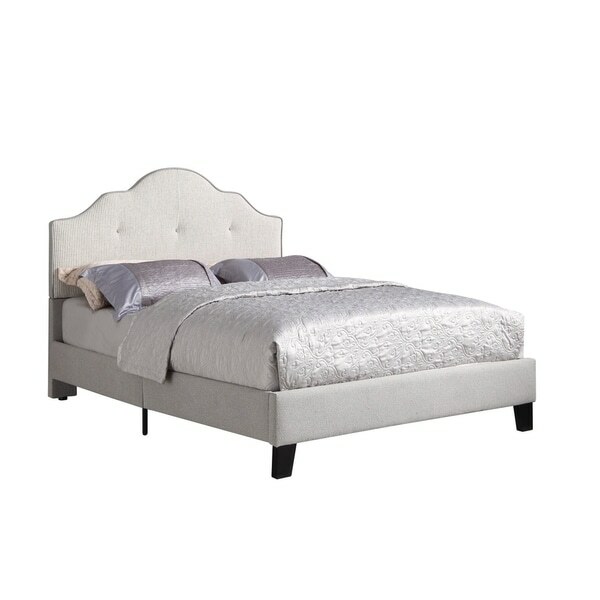 The vibe of the headboard is classic-modern, can be used with a simple, minimalist room decor, art-deco glam or in a more traditional-style room. Like the tuft buttons and stripes. Overall very satisfied. Easy to assemble, takes two people and able to be put together in about an hour. Finished product looks stylish yet classic in our bedroom giving it a well needed upgrade. Highly recommend for those traditional types who want to break away from the sleigh bed for something a little different. 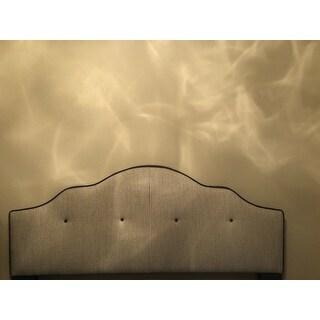 This bed is BEAUTIFUL! It definitely takes two to put it together for a King size, at least. My only issue is that it took WAY longer to deliver than stated and when we got it, the packaging was beat up like prize fighter that lost his title. There was a large stain on part on one of the rails (material). Other than that, it’s definitely beautiful & id buy it again! Looks great. The on thing is you need a handy man to put it together! Priced great. The pinstripes was not photographed well on site . When we got it it was so bold and horrible. 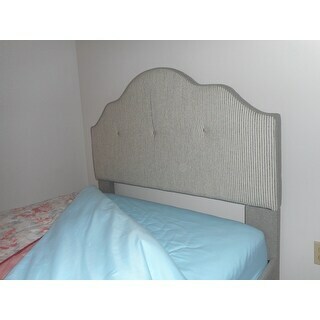 "What is the height of the headboard? 6.3" cannot be right. Is it 63"?" 54"H x 59" W x 81" L. So the headboard is 54".